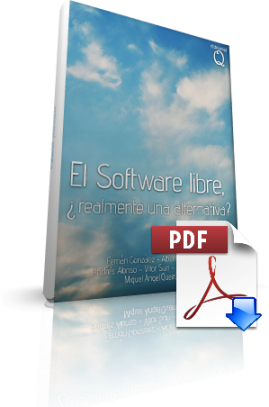 Free software, does it really an alternative? “Free software is software that respects your freedom and the social solidarity of your community. So it’s free as in freedom”. The recent discussions about free software carried out in the CoP 8 (Open source software and open educational resources) reminded me a project that we did a few years ago in school. All began just like a question through a blog with my students. Something like: “If it really is an alternative … why is not used more often? The students (Fernan, Alberto, Andres and Vitor) decided to investigate the use of software in schools. At that time they were studying 3rd of Secondary Education. What began as a statistical project was growing and growing. The students make a poll and contacted with all schools of our city, Burgos. The collected data were treated statistically. There was a lot data! It was a project in which we were working on for several years. To disseminate the results, we built a web site: http://www.rinconsolidario.org/gnu. Moreover, from this website you can download a digital version of the book published that we distribute to all schools and libraries of Burgos. Download It now! One of the authors (Fernán González, @fernangonzalez) even got an interview with Richard Stallman, the father of Free Software Foundation, (see interview), who really liked the idea of the project. The project also received a National Award (see more and more!). Who would tell us that free software would have such scope!